You've just spent all day writing your best blog post ever and are just itching to click that ‘Publish' button so you can get to cracking a bubbly pop in celebration. Before you make your post public however, here is a list of 12 things you can and should do to reach a wider audience and get more traffic to your blog. Every article you post to your blog should include a captivating image that can be clicked and pinned to Pinterest. I use the Pinterest “Pin it Button” plugin for WordPress to make it easier for my readers to pin my graphics. Adding the title of your post onto the image inspires more readers to pin the image. For the image to show up in Google's Image search results, be sure to add a title and alt text to the image as well. Both the Pin It button and the image title show up when readers scroll over the image. The alt text will also appear as the caption on Pinterest. Have you placed the post in the most relevant category(ies)? My default category is ‘News' and during a recent review of past posts, I found it amazing how many were categorized only under ‘News'. UGH. Any post is visually enhanced with Heading tags, such as <h1> to <h6>. Heading tags draw the reader's attention to the important points you've made and also allow them to quickly assess what is of most interest / value to them. Search engines use your headings to index the structure and content of your web pages. <h1> headings are automatically coded into your blog post's title, so start by using an <h2> tag for the most important sub-headings, then <h3> and so forth. To encourage your readers to share your post on social media and bookmarking sites, make sure you've installed a social media plugin. I'm using Social Share & Locker PRO on this blog. 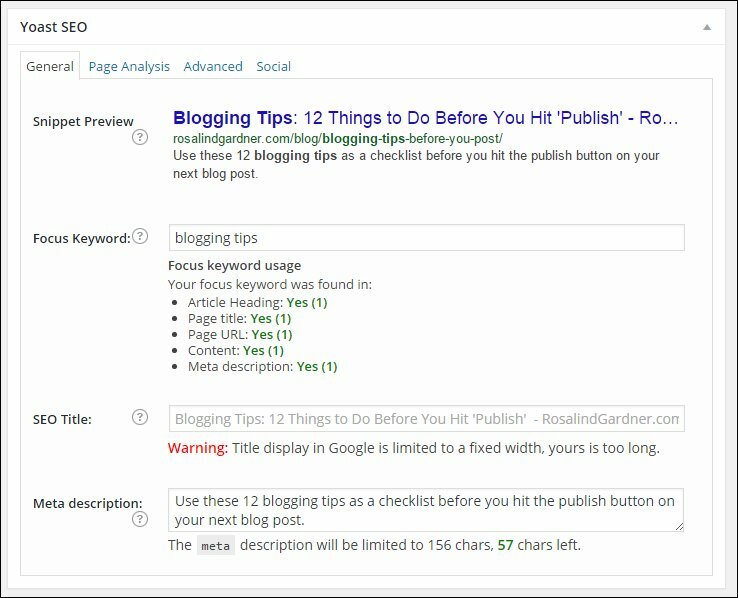 Installing a related posts plugin such as YARPP (Yet Another Related Posts Plugin), will keep more visitors on your site longer, which Google Analytics notes in both lengthier session durations and lower bounce rates. Make sure your affiliate links are cloaked. Make sure all affiliate links are coded rel=”nofollow”. Google frowns on links that are placed solely for the purpose of earning commissions and penalizes the site. Place links to relevant content on your own site. Internal links increase the Google juice for the pages and posts to which they are linked. Test all links to make sure they go exactly where you want them to go. You'll want to have written descriptions of the article content for SEO and social media sharing purposes. Each description, or snippet, should conform to each agency's specified limits, i.e. Tweet (Twitter) length is 140 characters maximum and meta descriptions are limited to 152 characters. What would you like your readers to do when they finish reading your post? Should they be directed to read more about products you've mentioned in the article, buy the product you are recommending in a review, or delve deeper into the subject. Decide what it is you want them to do and then write that as a call to action. Involve your readers by inviting them to ask questions and place comments on posts as appropriate. Hi comment counts are an indicator to Google that your information is engaging and therefore worthy of higher rankings. Remember to respond to those questions and comments too! You've probably already done this at least dozen times, but do it just once more to spot and correct spelling and/or grammatical errors before you publish. But yes, I am so very grateful to those who take the time to let me know when I've goofed up… again. 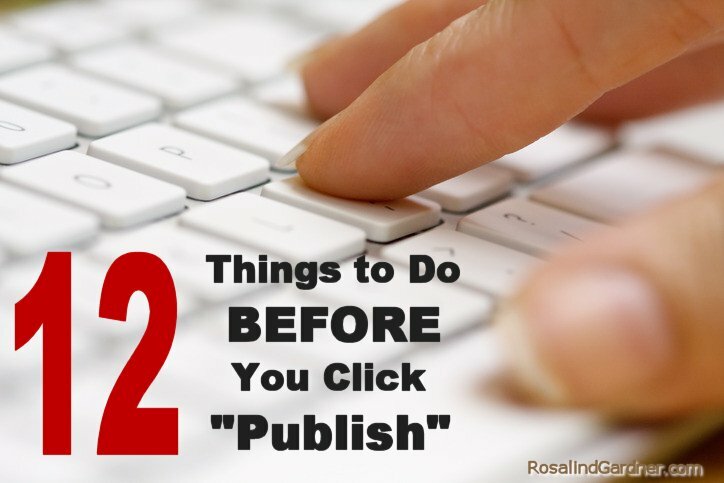 Use these 12 blogging tips as a checklist before you hit the publish button on your next post. OK, NOW you can click ‘Publish' and enjoy that bubbly pop. If you have a comment or question about these blogging tips, please leave a comment below! Thanks for another great post. I see that I’m a little late ‘checking in’. Winter in the south got the best of me over the past few weeks! I’d just like to ask about Pinging. Is it appropriate to include a long list of services, as described in your post, or does one list just a few services – 3 – 5 for example? Thanks for your generosity Rosalind. No worries! As a Canadian, I totally understand how winter can get the best of one. You can add the full list of ping sites or just a few as your heart desires. I wouldn’t bother to list those that are already included at http://rpc.pingomatic.com though. Thanks so much for your response Rosalind. That is a huge help to me! Second, I have to agree with Dale S above, the social icons did get in the way a little, but it did not stop me from enjoying the article. Back to the article. Even though I thought I knew something, I learned A lot more. I immediately went back and re-read my articles and checked for errors. Thanks for the tip about images and Pinterest, I was not aware of that. Actually just Thanks for the great writing. You are appreciated. So do I understand correctly that the floating vertical social icons are still a pain? Thank you again for providing such great information on “tips before you post.” I wish I had read this yesterday. I think I will go back and check my latest post. I will be checking my older post and definitely watching on my new ones. I’m with you. I learn something new everyday from other affiliates and bloggers as well. It’s a great community and I enjoy being part of it. Thank YOU for sharing! P.S. I’m getting error both on your URL and on the domain in your email address. Yes.. I am going through some issues with my hosting. Of course nothing is easy.. To much traffic coming in which is good but bad at the same time.. LOL..
Rosalind.. One more question.. I read your book years ago and you concentrated on PPC promotions. Do you do that anymore and have Pinging services worked out for you? Yes.. I am definitely on your list. Could you add information on how you setup your email marketing campaigns and how you lead them to your call to action. GREAT advice, Rosalind! For one, I’m putting those plugins on our websites. Thank you! I love your books: Make a Fortune Promoting Other People’s Stuff Online… and The Super Affiliate Handbook! Such valuable wisdom and guidance! My amazing fiancé Jackie & I are just starting out – we are writers and are now branding ourselves in our niches through our books (3 to come out soon!) And then we will really get into blogging and Affiliate Marketing. Thank you for sharing your wisdom so generously! Nice to hear that you found these blogging tips useful. Thanks for sharing. Is nothing” would be much better. A side from my criticism I love the suggestions. I have not yet started my Blog. I have a WordPress.com Domain. .org with-in settings someone told me. Can’t find It. I remember setting It as .com. But How to change It back now? Thanks kindly for letting me know about the social media cluster. I just changed it to sit right along the left side of the page. Is that better? I’m not sure what you mean about ‘changing it back’ to .com. You should perhaps read this article about WordPress.com hosting for affiliate marketers. It’s not a good thing to do. You latest iteration of Genesis looks great Rosalind. Minimal but very professional and effective. Hi than you so much, how do I guet this Update Services. ? Go into Settings > Writing in your WordPress administration panel and scroll to the bottom of the page. You’ll see Update Services with a box there. You can add the list of update services I’ve listed in this post. Remember to save your changes. When you publish your post, WordPress will ‘ping’ other sites to let them know that your post is now online. It’s just a way of getting the word out farther. But you have to have those update services listed under Update Services.